Back in January I made a new quilt top for my grandaughter, you may remember it from this post here. My colour palette was a pretty pastel combo of pinks, brown/grey and blues with gold accents, and was inspired by the lovely ways Susan from hopewoodhome combines colour in both her home interior stying and in her quilts. It's been great working with this lovely calm palette. And there are so many of my favourite fabrics in this, including a little Liberty, Anna Maria Horner, Outback Wife, a basic blue & white check and of course the Kaffe border print mauve Guinea Flowers, which I've had in my stash for some time now. I have recently had it machine quilted by Sandy Mayo from 'quilt me creations' (see here for her details). She used a twirling floral edge to edge pattern, one that gently flowed over the edges of all those 'bricks'. I used a vintage floral sheet for the backing and the dusky pink binding that I think really finishes it off nicely - in a girly sort of way. - love sewing the small-er stuff! And it's all ready now for Evie's first sleepover. over here at cleverchameleon where there's lots of colour & inspiration! I love the mix of flowers, dots, stripes, gingham and small prints. Such a sweet quilt for Evie. She will sleep like a princess during her first sleepover! Very pretty! Evie will have very sweet dreams while cuddled up with that quilt. A very sweet scrappy quilt. The fabrics are so soft and inviting. Thanks for sharing with Oh Scrap! What a sweet quilt! Congratulations on your finish. 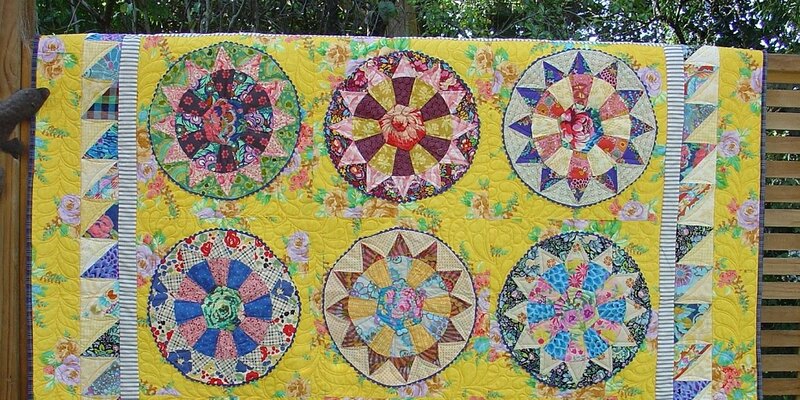 LOVE that flowery quilting, too!! What a pretty quilt - so soft and sweet looking! I bet Evie will love it! This is a lovely finish. Gorgeous collection of so many fabrics. It's fun to make a quilt for when they visit. And thanks for the link to Susan's color inspiration photos. She does have a beautiful sensibility. Your quilt is really pretty, looks lovely on the bed. That is so pretty - love the colours in that Outback Wife fabric that you have used as your inspiration. Thanks for linking to Sew, Stitch, Snap, SHARE and for introducing me to Hopewood Home. So sweet and KF Guinea Flower makes a beautiful border, I'm sure Evie will love sleeping under this quilt. Thanks Maureen. It always surprises me just how much I do love a softer looking, simple quilt, when so many of my quilts end up bright & bold. The details are “in the mix” that’s for sure with this little scrappy quilt! I somehow missed this the other day. Beautiful work! Such a sweet quilt. Bet Evie loves it! So pretty and lovely mix of colors. Perfect combination of fabrics! I would love to make a 16 patch quilt with those fabrics! It's a great idea for a special quilt on the sleepover bed. This is very lovely, and with all that mix of fabrics, it still reads as feminine. She's going to love this! This is such a pretty quilt and all ready for such a special occasion. This quilt is going to capture a lot of precious memories for you and Evie. Thanks for linking up at Clever Chameleon. This is stunning! 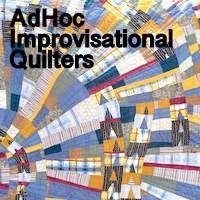 I love the colours and the pattern of free motion quilting you used.